MINNEAPOLIS, APRIL 8, 20011--The second season at the Target Field is upon us. As the ground begins to thaw and the air warms to a balmy 45 degrees, the people of Minnesota have awaited the opening home game with baited breath, excitement and hope for what is to come. But, there is another side to the Target Field beyond home runs, excited fans and Joe Mauer. On May 4, the Twins will open up their field for WCCO Sport reporter, director and anchor Mark Rosen’s Sixth-Annual All-Star Afternoon. The event supports ACES (Athletes Committed to Educating Students), a Twin Cities nonprofit organization that provides after school programs to at-risk students. The Minnesota Twins are one of ACES’ professional sport league supporters; and have been helping ACES’ staff, volunteers and students in the goal to close the academic achievement gap by making various generous donations every year. So what does this have to do with sports? Well if we think back to the cardinal rules of baseball, the sport is constructed on elements of teamwork, goals and commitment. The Twins understand that they aren’t just a MLB team; but they are a part of this great community with fickle weather that we call Minnesota. Sometimes, it’s easy to forget that baseball extends beyond the gates of the great TF, but the Twins aren’t likely to forget their importance to the community any time soon. By coaching students that might have struck out a time or two, or might be down on their luck in their first couple innings of life, the Twins practice teamwork outside of the game. ACES students learn to overcome the academic curve ball life has thrown them and move beyond to find success. This is part of a legacy to our community, and we can see that teamwork, goals and commitment can expand to all aspects of life in the Twin Cities. As you sit in the stands this summer with the quintessential hotdog and cold beer, remember you’re not just watching a game. This is a Minnesota legacy, tradition and community. This is Twins Territory. That's a neat little feature at target field. Who cares what it means? Adds individuality to the ballpark. Target Field is building a legacy too. 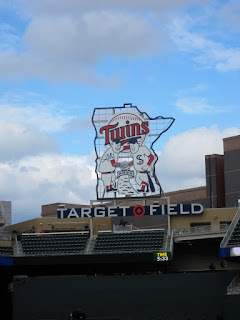 This is truly a state of the art baseball stadium so if you haven't been there, you are missing out on a Minnesota gem.